2015 has been the fourth time that Bio-Circle Surface Technology GmbH participated in the motorsports racing season as an advertising partner. WE support the traditional racing team Konrad Motorsport from Verl. Excellence, team spirit and passion are the things that this premium sport and our company Bio-Circle have in common. BIO-CIRCLE and bio-chem products can often be found in motorsports, but also in the automotive industry. Sustainable cleaning at the highest level is an important issue in this fast sport. So you may well find a BIO-CIRCLE parts washer in one car workshop or another. Experience thrilling racing moments with us. The Porsche Carrera Cup 2016 championship title goes to Konrad Motorsport. 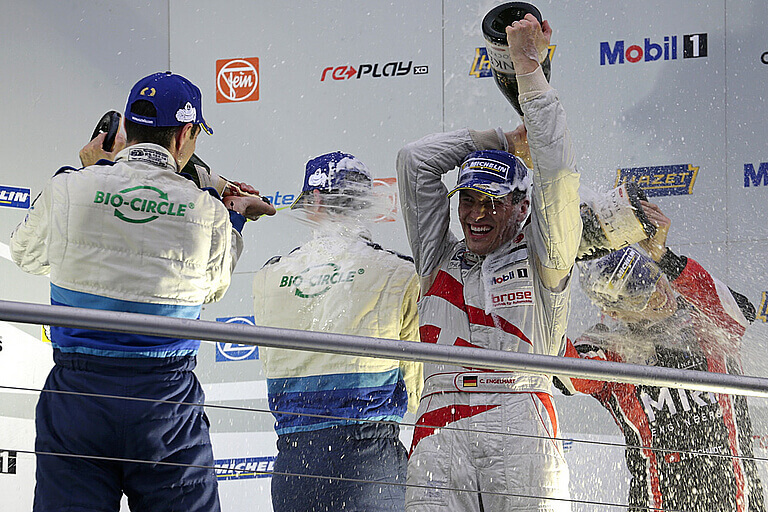 Sven Müller clinches the driver’s title in the last race of the season. The team around Franz Konrad also claim team victory.